WHAT HAPPENED: Sloane Stephens, the 24-year-old American who earlier this year was confined to a wheelchair after foot surgery and 11 months off tour, won her first major, the US Open, on Saturday. The unseeded Stephens, who was ranked No. 957 at the start of the summer and is now at No. 83 in the world, crushed her close friend and fellow Grand Slam debutante, 15th-seeded Madison Keys, 6-3, 6-0, in just one hour of play. The two shared an emotional, teary hug at net. Stephens then raised her arms in a look of disbelief. Surely she too was stunned at the turn her career had taken in just a few short weeks. After the tears, Stephens and Keys, 22, shared an extended, giggling chat as they waited for the championship ceremony. Stephens got up from her chair to join her friend on the sideline. "I told Maddie I should just retire now," said Stephens. "It's never going to get better than this. " Stephens held her nerve and played controlled and consistent tennis, hitting loopy topspin ground strokes deep into the court to counter Keys' powerful weapons and force her into a rash of unforced errors. Stephens, known for her athleticism and fleet-footed movement, zipped smoothly around the back of the court, making Keys hit more balls than she was comfortable doing on a day in which she was unable to summon her best game. "It's incredible," said Stephens. "I had surgery Jan. 23. If someone had told me then that I would win the US Open, 'It's impossible,' I would say. This journey has been incredible, and honestly I wouldn't change it for the world." It was a disappointing final for Keys, who just one round earlier had been on the other side of a route. The big-hitting Californian had played near-perfect tennis in the semifinals, surrendering just three games to CoCo Vandeweghe. Keys was a different player on Saturday, succumbing to the pressure of facing her friend and trying to claim her first Grand Slam crown. She committed 30 unforced errors in the match. Stephens, poised and calm in her first final appearance, made just six. Stephens won eight straight games to finish the match. "Sloane is truly one of my favorite people," said Keys. "To get to play her was really special. Obviously, I didn't play my best tennis today and was disappointed. But if there's someone I have to lose to today, I'm glad it's her." 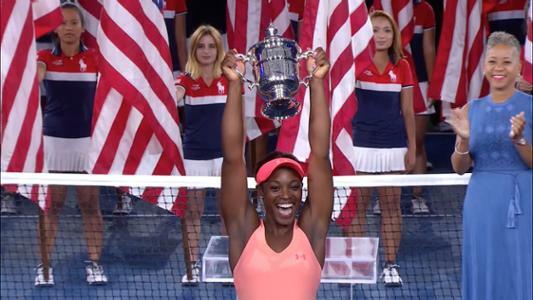 WHAT IT MEANS: Both African-American young women had long been touted as future Grand Slam champions. After injuries to both and time away from the tour, it rated as a surprise that they met in this year's Open final. Keys had surgery on her wrist at the end of last year and only returned to playing tournaments in March, at Indian Wells, before undergoing a second procedure following the French Open. Stephens and Keys had only met once previously; Sloane also won in Miami in 2015, in straight sets, 6-4, 6-2. MATCH POINT: Stephens became the lowest-ranked champion at the US Open. (Kim Clijsters was unranked when she won the title in 2009, returning to the tour after giving birth to a daughter.) She wins her fifth career title and her first major; her previous best was reaching the semifinals at the Australian Open in 2013. Stephens also becomes the first American champion other than Serena and Venus Williams since Lindsay Davenport, Keys' coach, won the US Open in 1998. She is just the fifth unseeded player in the Open era to win a Grand Slam title. September 9, 2017 - Sloane Stephens reacts to beating Madison Keys in the Women's Singles Final match at the 2017 US Open. September 9, 2017 - A Net Generation kid participates in the ceremonial coin toss with Billie Jean King, Sloane Stephens and Madison Keys in the Net Generation "Kids on Court" Demonstration before a final match at the 2017 US Open. September 9, 2017 - Sloane Stephens in action against Madison Keys in the Women's Singles Final match at the 2017 US Open. September 9, 2017 - Madison Keys in action against Sloane Stephens in the Women's Singles Final match at the 2017 US Open. September 9, 2017 - Sloane Stephens in action against Madison Keys in a Women's Singles Final match at the 2017 US Open. September 9, 2017 - Madison Keys reacts during her Women's Singles Final match against Sloane Stephens at the 2017 US Open. September 9, 2017 - Sloane Stephens hugs Madison Keys after winning the Women's Singles Final match at the 2017 US Open. September 9, 2017 - 2017 US Open Women's Singles Champion Sloane Stephens and finalist Madison Keys.